This product finds the closest dealers to the post code of origin by executing a radial search using the Post Code Anywhere service. This product finds the closest dealers to the post code of origin by executing a radial search using the Post Code Anywhere service. 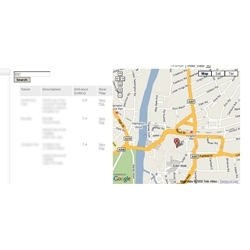 After the user is displayed results for their search they have to option to view a map of the location they select. This is done through an embedded Google map using the longitude and latitude of the selected location. - Installation requires minimal knowledge of HTML and the ASPDNSF system. - Requires a Post Code Anywhere account.